There is an edgy feel that you get in a new restaurant, when staff is still figuring out how the system works, the kitchen is still experimenting, and the service staff is gamely trying to keep diners from noticing the problems. They do, but most forgive and decide to come back later when things have settled down. It’s a problem if things don’t settle down, especially when the establishment is one you had high hopes for. 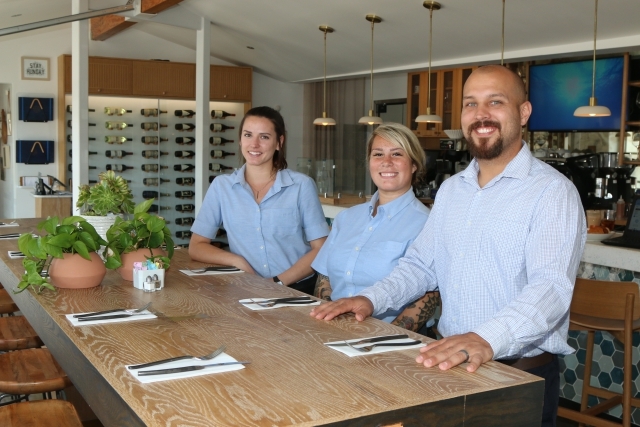 Serve on Second opened in South Hermosa with the promise of being a moderately priced family restaurant with a wine bar. Since most places near the beach cater to the party crowd this was a daring idea. As the remodel of the former Tammie’s went forward I wondered at a few of the design choices, but liked the sliding windows that created an indoor/outdoor space. After they opened in May, I gave them a few weeks to get their act together before stopping in. It wasn’t enough. A chicken teriyaki bowl came with the sauce added just before serving, which isn’t how teriyaki works – it’s a marinade that caramelizes and deepens in flavor on the grill. My server was so involved in training a new person that she ignored customers in favor of a lesson about how to operate the ordering system, which is not the thing to teach during the lunch rush. There was also a problem with the acoustics in the small corner room, because even with only three tables occupied it was loud and there was a lot of noise from the kitchen. My server was apologetic and was obviously trying hard, and I decided to give them a little more time. Three months later I had friends in from New Zealand who wanted to dine near the beach, so I decided to treat them to dinner at Serve. We were seated at the same table I had occupied before, and I could immediately tell that one problem hadn’t been addressed. The room was full now and very loud, thanks to both conversation and high volume pop music. They did drop the music volume a little at my request, which helped, but it was still impossible to converse in anything like normal tones. The menu here is fairly short, moderately priced, and has some interesting items. We decided to start with a Caesar salad, crabcakes over a salad with jicama, spinach, mango, and cilantro, and buffalo cauliflower, an item my friends from overseas had never tried. Had our meal ended right after we tasted those, we would have considered Serve on Second a success. The cauliflower had been tossed in a mildly spicy sauce before roasting and was served with some tzatziki sauce to cool things down It was a marked improvement over the usual ranch dressing. The crabcakes had been seasoned with mild herbs so that the seafood stood out, and we were impressed by how the flavors in the salad were integrated and played well with the protein. We were less happy with the side Caesar, which had a dressing that lacked either anchovy or Parmesan, so the greens were merely wet rather than flavorful. It was an odd lapse in a kitchen that had gotten the rest right. While we ate we all remarked on the unusual cutlery, which seems to be comfortable only for left-handers thanks to oddly curved handles. When we mentioned this to our server she replied, “We get a lot of comments about that,” with an eye roll that spoke volumes. I had been interested in the roasted caramel chicken stuffed with prosciutto and sage as a main course and was actually ordering it when I inquired how sweet it was. Our server said that they didn’t actually make it that way anymore, and if you order that now you just get roast chicken. This seems like the kind of thing you would tell a customer as you hand them the menu. I decided to have the “red chard crusted ahi” instead, while my companions had a roasted Alaskan salmon salad, a steak and shrimp surf and turf, and a burger. When my fish arrived, I did a double take – there was ahi on the plate, but it had been sprinkled with spices and seared rather than being crusted with anything. When I brought this to the attention of the server, she said that they decided to make it differently because the version listed on the menu wasn’t popular. That may be the case, but I would have expected after I had just changed my order because it was different than what was listed, someone might have thought to tell me that they had changed this too. It wasn’t bad, but it wasn’t what I wanted. My companion’s surf and turf was a small filet mignon, two medium shrimp, scallion Yukon potatoes, and prosciutto-wrapped asparagus. It was a beautiful plate. The only problem was that the steak had been requested medium-rare and was cooked well-done. A manager happened to come by as we cut it open, and after finding that the server had filled out the ticket correctly he comped the meal on the spot and ordered another one made. When that arrived it was delicious thanks to an nicely intense mushroom sauce on the meat. The burger was a solidly executed standard item, and the salmon over a Bibb lettuce salad approached brilliance, thanks to dried cranberries and cherries, red grapes, and a honey vinaigrette over the greens. The combination of fresh and dried fruits complemented the fish nicely, and it’s something I’d have again. The bar offers sake-based and infused cocktails, some of which are downright weird. The “cucumber martini” contained cucumber sake, lemon juice, simple syrup, and a lemon twist. None of those ingredients, except the lemon twist, belong in a real martini. We decided to order wines and a beer from the oddly unbalanced list, which offers IPA’s, light beers, and one Belgian sour, but no ambers, darks, or cider. We skipped dessert because my companions wanted to get away from the noisy environment, but my wife and I decided to return the next weekend for breakfast. Surely, we figured, things will be more peaceful then. We were seated in the main room near the bar, and though the room was only about half full it was still loud enough that the servers at both adjacent tables had to ask customers to repeat orders. We ordered a mandarin orange and goat cheese muffin out of sheer curiosity and a breakfast burrito and a French toast sandwich as main items. The muffin had a slightly caramelized sugar top and just enough goat cheese in the batter to make it fluffy and aromatic. I’m not usually a big fan of breakfast muffins, but this one was first rate. The breakfast burrito hit the spot, too, the big tortilla full of eggs, sausage, onion, and potato topped with a good medium-spicy red sauce and melted cheese. The French toast sandwich was stuffed with scrambled egg, Chambord jam, a tiny portion of bacon, and vanilla maple syrup on the side. Had the bacon been a more assertive flavor the smokiness would have been a nice complement to the jam, but as it was, all I tasted was fruity eggs. My wife had ordered it with a melon and berry fruit cup instead of the breakfast potatoes, and while the fresh fruit flavors were all good, the syrup was superfluous as no more sweetness was needed on that plate. There are enough good ideas at Serve On Second that the place can be saved, but it’s going to take some work by both the front and back of the house. Hermosa needs this place as it could be.